Cousins reunited. Photo by Xander Stobbs. My paper bird puppets started out as a project for my wedding, but they've turned into an activity that I can take to places. 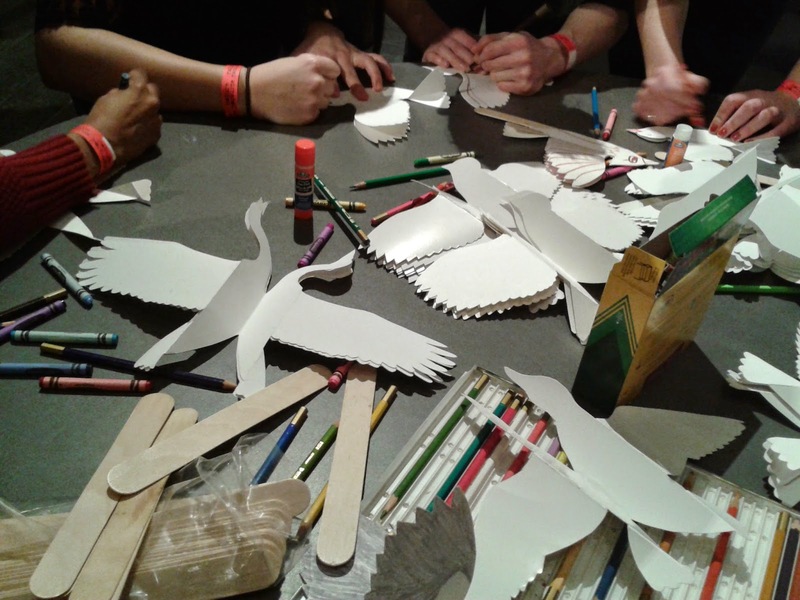 I provide the bird cutouts, and people can assemble them and decorate them any way they like. After a successful test run at last year's Chinatown Remixed festival, I was keen to take the activity to a museum. The Canadian Museum of Nature holds a monthly nighttime party called Nature Nocturne, where adults can eat, drink, dance, and wander the exhibits child-free. Chinatown Remixed was in charge of running the Nature Nocturne on January 23, around the Lunar New Year. 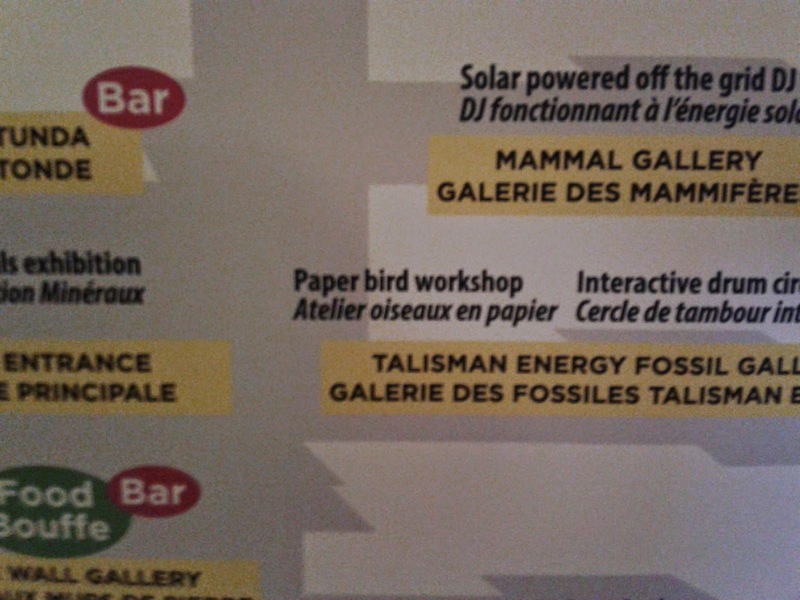 They included me and my birds as one of the activities. They put me in the dinosaur hall, which made sense to me -- after all, birds are dinosaurs! My table was right at the front of the exhibit, under the watchful eye of Daspletosaurus and Chasmosaurus skeletons. I'd made a few modifications to the design since the last time I'd done this. In addition to the original blackbird shape (which also works as anything from a thrush to a finch), I made an eagle shape, a duck shape, a cardinal/bluejay shape, and (most popularly) a heron/crane shape. To simplify things, I also replaced the metal coathanger, which I'd been using as a control rod, with a popsicle stick. This eliminated the need for a glue gun and for time-consuming rod straightening. I'd planned to use a laser cutter to cut out the birds; I created vector files for all the shapes and got certified to use the cutter at the Makerspace at the Nepean Centrepointe library. Unfortunately, by the time I got the go-ahead from the museum, the laser cutter was all booked up, so I ended up cutting out all seventy birds by hand. Next time, I guess! It was a great success. People loved it, all the birds I made got used up, and I had a big grin on my face the whole time. This is clearly the kind of thing I was meant to do. I also took plenty of notes, so I can do it even better next time. My friend Pixie Cram has uploaded a trailer for her latest film, Joan. It's an impressionistic seven-minute retelling of the story of Joan of Arc, done using stop-motion animation -- including pixillation, or stop-motion with live actors. Joan Trailer from Pixie Cram on Vimeo. I helped out on some of the shots, and I actually appear a couple of times in the film as well. Joan has had a couple of screenings in Ottawa already, and I'm sure there are more to come. Check out Pixie's website for information on where you can see it. In the meantime, here's a really cool interview that Pixie did about the film. Update, October 2016: The film is now online! Check it out!